The games begin Monday, 10th December, PM (my time) / Tuesday, 11th December, AM (your time). Rules are simple - Each day, for 12-days, there will be a game. The person who has the CORRECT answer and posts it here will win the game for that day. If more than one person has the correct answer, those player's names will be put in a hat. Mr. Elf, aka Wayne, will draw a name out of the hat and that person will be the winner for that days game. Mr. Elf will announce (post) the winner's name. No holds barred - you are eligible for a daily prize even if you have won a game in the last 30-days AND you can play every day! This means, for example, if you are the winner of two games, you receive two prizes; three games, three prizes, etc. Please make sure you read the instructions for each game. So, scratch your noggin to get the brain juices flowing and start the countdown . I get to dress in an Elf suit this year! Looking forward to this, Ruthie ...! Just make sure you have your glass eye in Wayne when you're pulling names out of the hat!!! Perhaps also wear your charity shop false teeth in case you need to grit them as you make the careful manoeuvre with your hand into the hat?! I am open to bribes! Wayne unpacking cleaner for glass eye, monocle for 'good' eye, replacement 'choppers' (upper and lower), Elf-abet Thesarus, 'sweets' to calm the 'shakes', sharpened pencil and strips of paper and MapQuest directions to hat. Methinks he is 'good to go'. I am a card carrying member of the Elf Union so treat me good. We kinda like Lord of the Rings except we wear green tights. Are they very, very tight? The first game starts 'sometime' today (my time) ! Will YOU be the first winner ? you can see my membership number on my membership card in my pocket that's how tight they are. Again, each game 'runs' for 'around' 24-hours; give or take an hour or two. Remember.... The person who has the CORRECT answer and posts it here will win the game for that day. If more than one person has the correct answer, those player's names will be put in a hat. Mr. Elf, aka Wayne, will draw a name out of the hat and that person will be the winner of that game. Mr. Elf will post the winner's name here 'sometime' Wednesday (given the 8-hour time difference, I will probably still be 'watching the inside of my eyelids). Game #2 will start before Game #1 winner is announced. Game #1.... starts out 'nice 'n easy' - wouldn't want to 'overload' the 'grey matter'. You may need it for one or more of the upcoming games. I see a kitty peeping through the tree above a bauble - it's head and eyes are visible above the red candle, slightly to the left. A cat in a Christmas tree. 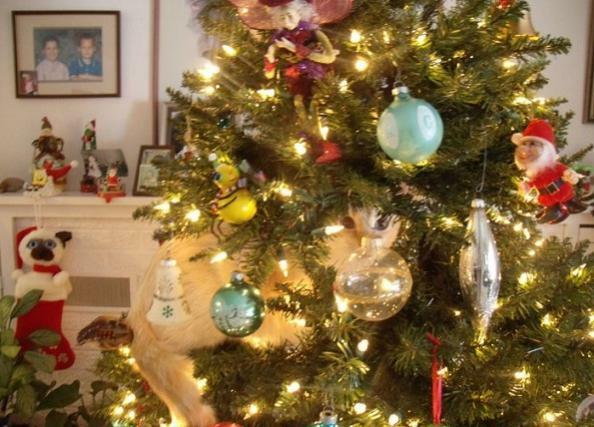 Funny:laugh:....Also, the cat ate all the tinsel. The cat is a rare golden Chinchilla perhaps that's why it's eaten the tinsel? Satan's little Elf is watching and making notes and when I am done making notes I will be spending them on xmas presents. I am having problems with the silver security strip but hopefully the general grocer won't notice. I`m watching you. And I`ll tell. And I already bribed Wayne. And in the interests of the nation it is my turn to win. Because I have never won anything. Just Beachin.... My apologies. Kinda / Sorta 'thunk' that one 'something' would 'jump out'. So, if one 'something' does, note it here in the post and perhaps you will be the winner of the first game. Keep the guesses comin'. Who knows... maybe there will be more than one person with the correct answer and they will get a visit inside Mr Elf's hat... well, names anyway.